Are you a trustee who is anxious about creditors making surprise claims while you’re in the last stages of administering a trust? Are you trying to determine if a claim against the estate is genuine? Under normal circumstances, creditors have one year from the death of the trust settler to sue the estate for damages. Because trust administration can sometimes take less than a year, it could draw out the process unnecessarily. The longer time frame also increases the risk of a creditor stepping forward with a fraudulent or exaggerated claim. Though you’ll have options to disprove false claims, doing so could use up valuable time and resources. This could potentially cut into the estate. Consider limiting – and eventually ending – unexpected or questionable claims from creditors by invoking the creditors claims procedure. This statute is mandatory in probate but voluntary in trust administration. It will create a limited timeframe for creditors to file or pursue a claim. The creditor claims procedure can make a creditor decide not pursue further action. Especially if the claim is of questionable value or false. Either way, the creditor will be forced to decide on a course of action within a specific time frame. This allows you to prepare your case as necessary. Are you a trustee dealing with potentially false creditors claims against the trust you are administrating? 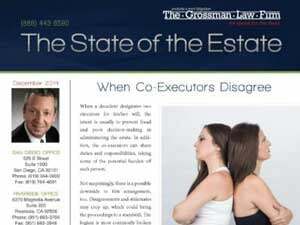 San Diego probate attorney Scott Grossman of The Grossman Law Firm offers a full scope of California estate services. 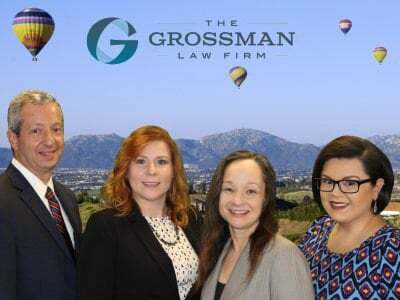 These include trust administration and probate, estate planning, trust litigation and will contests to clients in Riverside County. For a free, 30-minute conversation with one of our lawyers, call (951) 683-3704 or (888)443-6590 today. Additionally, ask for your copy of Scott Grossman’s FREE book. 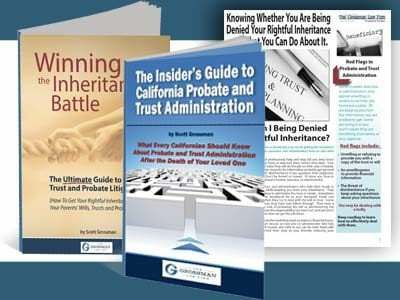 A must-read for every California executor and trustee, The Insider’s Guide to California Probate and Trust Administration.